No one would have faulted Hal Biestek for just kicking back and enjoying retirement after an aviation career of nearly 40 years in the military and then flying and instructing for United Airlines. He could have just indulged his passion for restoring award-winning cars and added more trophies to the shelf. Instead, he has chosen to play a key role in bringing sight to people around the world with his volunteer work for Orbis International. Biestek and Orbis go way back; back to the time when the nonprofit aerial teaching hospital was having its pilots trained at United and Biestek had the assignment of teaching them how to fly the DC-10 the organization had acquired for its worldwide missions. The big ship has been transformed from the days it flew for Laker Airways into a traveling hospital and it now delivers medical professionals trained in the techniques of saving and restoring sight to countries like Tanzania, India, Ethiopia, Zambia and Vietnam. Many flight instructors would have rightfully found great satisfaction in providing the training that made it possible for other volunteer pilots to fly the plane, but that wasn’t enough for Biesteck. 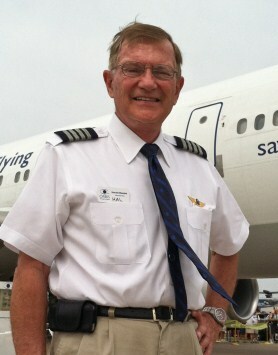 Throughout the later part of his 16 years with United he began to fly missions himself, and by 2012, he had logged 13 years of service with Orbis. Orbis missions are usually requested as much as two years in advance, and typically by the health minister of the country in need. As the time of the mission approaches, an advance team handles the logistics of where the airplane will be staged, even down to the exact spot where it will be parked on the ramp since it won’t be possible to move it during the two weeks or so that it’s on the ground. A few days before the departure Universal Weather & Aviation takes care of the actual flight plan and paperwork, making it possible for the Orbis crew to do what they do best, fly the plane and deliver medical staff, equipment and most of all, expertise where it is needed most. Biesteck’s long flying career began at the age of 16 with the Civil Air Patrol. His first lesson was in a Cub, and he soloed in a Champ. His first four years in the Air Force had him serving as a navigator on hurricane hunters and typhoon chasers before he trained in T-37s and T-38s. From there he moved up to the C-141 Starlifter and soon to the massive C-5 cargo hauler. Most of his time with United was spent in the DC-10, providing a natural pathway into his flying for Orbis. 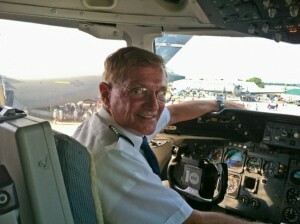 With an average of flying two to four of the typical ten to twelve missions the DC-10 flies each year, Biestek estimates that he has flown between 30 and 40 missions in his 13 years as a volunteer with Orbis. Mission after mission, volunteer doctors and nurses use the DC-10’s unique on-board operating room and classroom to dramatically change the lives of those who have lost or would be losing sight. And just as importantly, at each location they are there to teach; leaving behind doctors and nurses given the skills to take on the full-time mission of caring for their neighbors. The flying hospital has been reconfigured with a operating room with video feeds into a classroom (formerly the first class section) so that local doctors can watch live surgery and ask questions of an opthamologist . Beistek says that in addition to the Orbis staff doctors, others are eager to volunteer, including renowned eye surgeons with “procedures named after them, the best of the best”. Teaching during a surgery takes more time than surgery itself, but the payoff is worth the extra time. Orbis International says that because of the trained surgeons and support staff they leave behind, an amazing number of people have been helped over the years. Their best estimate is between 18 and 20 million patients.